Figure A. RPE conjugated Mouse anti Human CD8 ( MCA1226PE ) and Alexa Fluor 647 conjugated Rat IgG1 isotype control ( MCA6004A647 ). 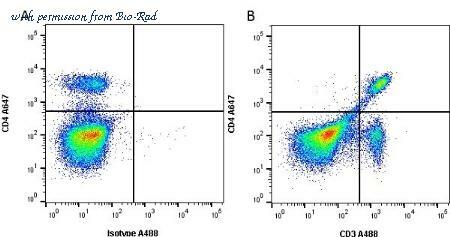 Figure B. RPE conjugated Mouse anti Human CD8 ( MCA1226PE ) and Alexa Fluor 647 conjugated Rat anti Human CD3 ( MCA1477A647 ). 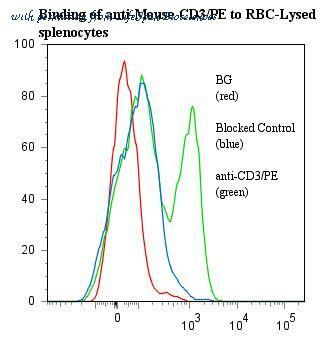 All experiments performed on red cell lysed human peripheral blood gated on leukocytes in the presence of human SeroBlock ( BUF070A ). 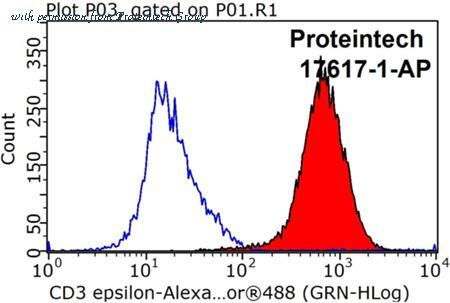 Figure A. Alexa Fluor 647 conjugated Rat anti Mouse CD4 ( MCA2691A647 ) and Alexa Fluor 488 conjugated Rat IgG2a isotype control ( MCA1212A488 ). Figure B. Alexa Fluor 647 conjugated Rat anti Mouse CD4 ( MCA2691A647 ) and Alexa Fluor 488 conjugated Rat anti Mouse CD3 (MCA500A488). All experiments performed on red cell lysed mouse blood gated on lymphoid cells in the presence of 10% mouse serum. Data acquired on the ZE5 Cell Analyzer. 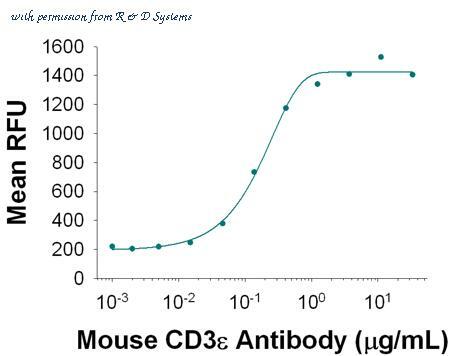 Mouse CD3 epsilon Antibody Stimulates Cell Proliferation in Mouse T Cells. Hamster Anti-Mouse CD3 epsilon Monoclonal Antibody (Catalog # MAB484) stimulates cell proliferation in mouse T cells in a dose-dependent manner, as measured by Resazurin (Catalog # AR002 ). The ED50 for this effect is typically 0.1-0.6 ╡g/mL. 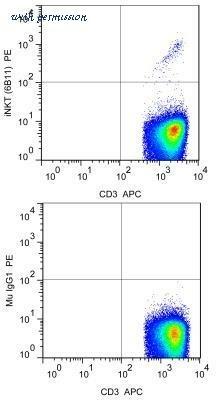 The CD3 antibody from Proteintech is a rabbit polyclonal antibody to a recombinant protein of human CD3. This antibody recognizes human antigen. 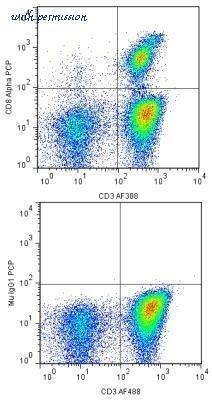 The CD3 antibody has been validated for the following applications: ELISA, FC, IHC, IP, WB analysis. 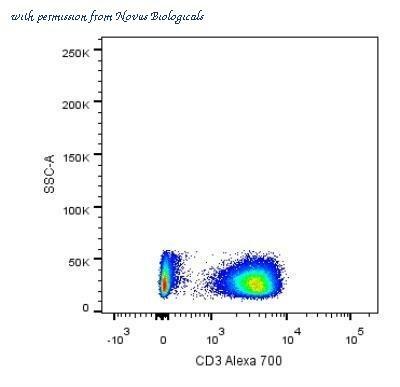 Flow Cytometry: CD3 Antibody (OKT3) - Azide Free [NBP2-24867] - Analysis using the Alexa Fluor (R) 700 conjugate of NBP2-24867. Staining of human PBMC. Image from verified customer review. 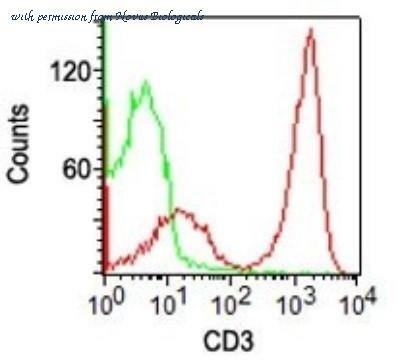 Flow Cytometry: CD3 Antibody (OKT3) - Azide Free [NBP2-24867] - Surface staining of human PBMC with CD3 antibody (red) and isotype control (green) at 0.2 ug/10^6 cells. 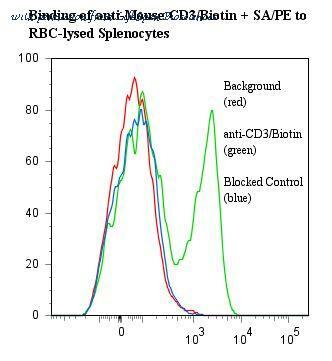 Flow Cytometry: CD3 Antibody (OKT3) - Azide Free [NBP2-24867] - Surface staining of human PBMC with CD3 antibody (red) grown in serum-free media and isotype control (green) at 0.25 ug/10^6 cells. 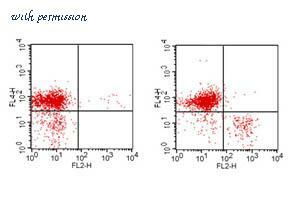 Flow Cytometry: CD3 Antibody (OKT3) [NBP2-25186] - Analysis using Azide Free version of NBP2-25186. Surface staining of human PBMC with CD3 antibody (red) and isotype control (green) at 0.2 ug/10^6 cells. 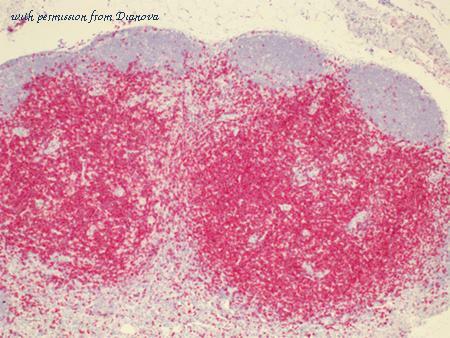 Immunohistochemistry-Paraffin: CD3 Antibody (SP7) [NB600-1441] - Mouse lung tissue stained against C3aR normal conditions (left) and knockdown conditions (right). This image was submitted via customer review. 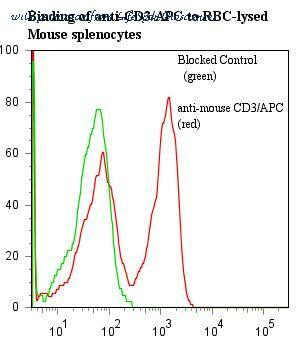 Flow cytometric analysis of Mouse spleen cell using CD3 epsilon antibody. 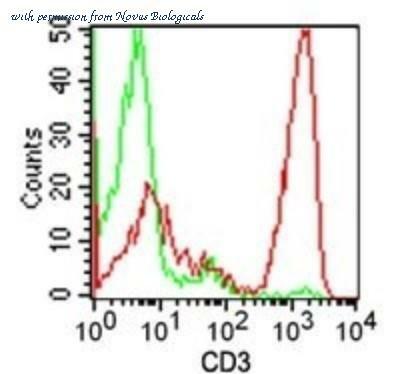 Flow cytometric analysis of (mo) Thymocyte Cell using CD3 epsilon antibody. Cell Surface Flow Cytometry of Hamster anti-MOUSE CD3 antibody Fluorescein conjugated. Cells: 10^6 BALB/c mouse splenocytes. Stimulation: none. 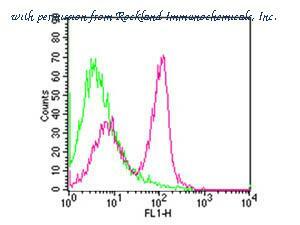 Antibody: (GREEN) isotype control antibody; (RED) Fluorescein Anti-CD3 Hamster secondary antibody using 0.25 µg. Cell Surface Flow Cytometry of Hamster anti-MOUSE CD3 antibody Phycoerythrin conjugated. Cells: 10^6 BALB/c mouse splenocytes. Stimulation: none. Antibody: (left) isotype control antibody; (right) Phycoerythrin Anti-CD3 Hamster secondary antibody using 1 µg. Also stained with Anti-CD19 APC conjugated Antibody. 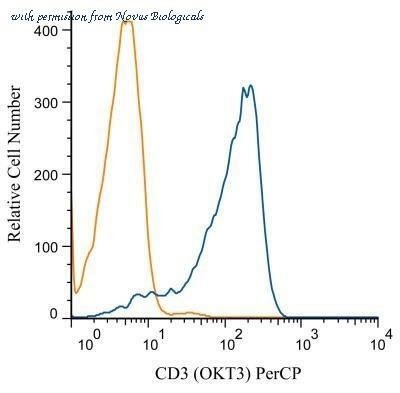 Flow cytometry of CD3E antibody This image was taken for the unconjugated form of this product. Other forms have not been tested.